Coldwell Street, outside Wirksworth Station, will be closed on Saturday 10th June from 09:30 until lunch time for a national cycle race. We advise visitors to arrive early, after the closure or catch the train from Duffield instead. The weather didn't turn out to be too bad apart from just as the last train was boarding, where everybody got drenched. In all though, not a bad Bank Holiday Monday with many happy visitors. The first train from Duffield had 151 passengers on board and it stayed happily busy all day. Even the last train back took some creativity to make sure everybody had a seat. Ruffle the Rail Dog was in attendance with a stall on Platform 2 and the story books are now for sale in the Booking Office shop at Wirksworth. All activities today were supported by the buffet, model railway as well as the narrow gauge. Down the yard, some fuelling was done and sorting out of the stores. Diesel loco haulage tomorrow and we're looking forward to the first Afternoon Tea train of the season. A reasonable Bank Holiday Sunday with passenger numbers on a par with yesterday. Many families took advantage of the Kids Go Free Weekend to enjoy travelling behind the visiting steam locomotive. Down the yard, the floor of the new shed extension had the nth coat of paint applied. Iris had a starter motor changed and the step boards painted ahead of her departure to Wales later this week and the Class 31 had a defective controller valve changed to ensure good service on Tuesday's afternoon tea train. Today's pic shows a group who whipped out a rather luxurious afternoon tea of their own as a picnic to have on the train! Progress Saturday 27th of May! Today saw the first operation day of our three train Steam hauled timetable carried out by visiting 3F 'Jinty' 47406. The loco performed faultlessly on all trains and the on train bar traded light refreshments for most of the day. Down the yard the 8F group were in attendance and the shed has had its second coat of paint awaiting 2 more tomorrow! The buffet had a good flow of customers sampling the ice cream, and the staff worked hard to keep up with the flow of people. I left the railway with the volunteers BBQ in full flow, something that doesn't happen very often! Another gorgeously sunny and hot day so lets hope the weekend is the same. Steam tomorrow and kids are free so get yourself along! 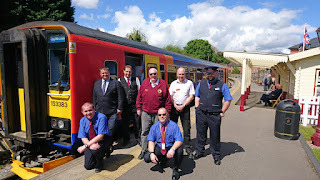 Today we hosted a Drive a Diesel Railcar Day for two happy guests. They enjoyed several return trips hosted by Graham and Richard. Work was kindly carried out to reinstate power to the Model Railway and kitchen car charging points following recent issues and the equipment was loaded and tested ready for the start of the Afternoon Tea season on Tuesday. The Maintenance Facility was shunted to clear the way for the new concrete floor to be painted and RRVs were moved to clear some space in the car park which might be needed this weekend. The station was cleaned, tidied and some bunting was put up ahead of the weekend too. The thermometer touched 33 degrees today so it wasn't really a day for heavy exertion. The PW team found some sleepers that needed changing that were in the shade so they were done. Down at the shed, Lee continued the bodywork repairs on the CK and Aubrey washed some of the coaches for the weekend. A gorgeously sunny and warm day which saw us host a charter for a local luncheon club. They enjoyed a charter DMU service to Duffield, followed by a hot meal in the Pullman. My thanks to everyone involved in this. It takes a lot of hard work and preparation to serve 40 hot meals to a top quality standard. The guests were very happy. Following this, puffing could be heard as Class 3F Jinty 47406 made her first and only test run to Duffield ahead of services starting at the weekend. Everything went smoothly and the locomotive is very at home on the line. The calm before the storm perhaps, with steam starting next week. Today gave the steam team an opportunity to shunt the Jinty to a water supply and fill the relevant parts. The DMU team were sparkling up the outside of Iris ready for its departure to Llangollen. The throttle motors were also adjusted and set up. The trains weren't overly busy but that is to be expected given a big weekend last weekend and a big one next weekend. Unfortunately, the weather today varied from glorious sunshine earlier in the morning to very heavy rain during much of the day which impacted negatively upon our visitor numbers. The two-car DMU Wirksworth to Duffield service performed faultlessly during the heavy showers and a special mention goes to Howard and his trainee third man who had the unenviable role of operating the crossing gates in such wet conditions. Down the yard there were various grinding and grunting noises coming from the maintenance shed and I expect Tim Oakes will post an update on the Duke team's progress later. The DMU fitters carried out a B exam on Iris including the fitting of new vacuum bags before her trip to the Llangollen Railway DMU Gala. The Class 31 and 33 had engine oil levels checked and topped up as necessary. On platform one the LMSCA were busy preparing the BSK in readiness for it re-entering traffic next week. Between showers the Commercial Team were gainfully employed too erecting the marquee for use over the next few weeks. They also welcomed Andy a new trainee booking hall clerk. Richard could be found conducting a number of yard tours and there was a steam service to Ravenstor today that proved popular despite the weather. Today's train services were supported by the EVRA shop, model railway and Pullman Buffet. It has been rather a hectic week around the railway which has, in part, contributed to the lack of progress updates on here. Last Friday we had rather a nightmare move of the visiting Class 153 with the lorry breaking down firstly on the A52 causing havoc in Derby City Centre and then again a few hundred yards from the railway in Wirksworth town centre. Our staff were on duty until gone midnight to ensure the unit could be unloaded and shunted ready for the naming ceremony the following morning. I know it was 01:40 when I got to bed! The Multiple Memories Gala was a huge success. 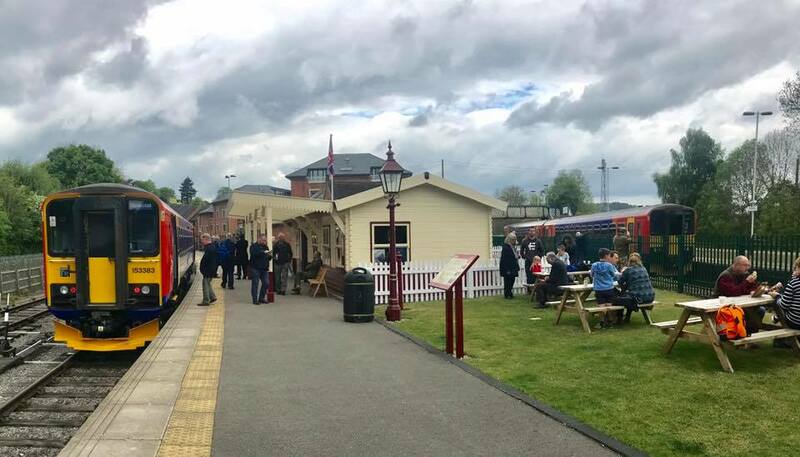 The railway was very busy on the Saturday with enthusiasts and members of the public coming to enjoy our large collection of heritage diesel railcars as well as the novelty value of the visitor. The naming ceremony was brilliant and I attach some photographs of the event. It was certainly strange seeing the unit on the other side of the fence to normal at Duffield. 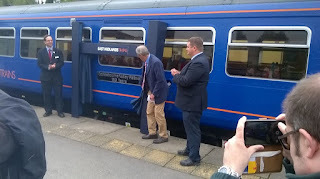 Our thanks go to East Midlands Trains for their support of the event - we thought it perhaps a bit cheeky asking for the unit knowing full well their fleet constraints so were very surprised when they agreed. Staff then continued to work late on Saturday evening where there was a fish and chip special train so both of these evenings contributed to a lack of report. Another late finish at the end of the gala on Sunday as we loaded up and waved goodbye to the visitor which was scurried back to Derby rather quickly as they were desperate for it to be working the Derby - Crewe service first thing Monday morning. Things settled down on Tuesday into a normal pattern with the steam teams working away down the yard as well as Lee on the CK coach. Our star guest for the summer season, 47406 Jinty arrived around 18:00 on Tuesday having made the trip from Peterborough Nene Valley Railway. The locomotive enters service at the Bank Holiday Weekend 27th May and then continues operating every weekend (all being well) until 6th August. At this point we have our visiting Class 26 diesel locomotive take over for two weekends (one of which is the Diesel Locomotive Weekend) before the Jinty bows out at the 1950s August Bank Holiday Weekend. Wednesday was fairly quiet around the site which enabled the maintenance team to construct the coach rake for the season and bring them down to the station for cleaning. Yesterday saw the diesel fitters turn their attention to Iris. The vehicle developed an issue during the gala weekend where one of the engines would cut out regularly. It seems this was caused by a loose connection in the fuel lines so it must have been drawing air in. The vehicle is withdrawn now anyway for an exam prior to it popping over to our friends at the Llangollen Railway in Wales for their DMU Gala on 3rd/4th June. Everybody has got quite wet over the last few days with the continuous rain and today was just the same. The station team looked at a wobbly step on the Gents toilet which was a good job done. More importantly though, we hosted one of the RAIB training days where they simulate potential incidents for training purposes. 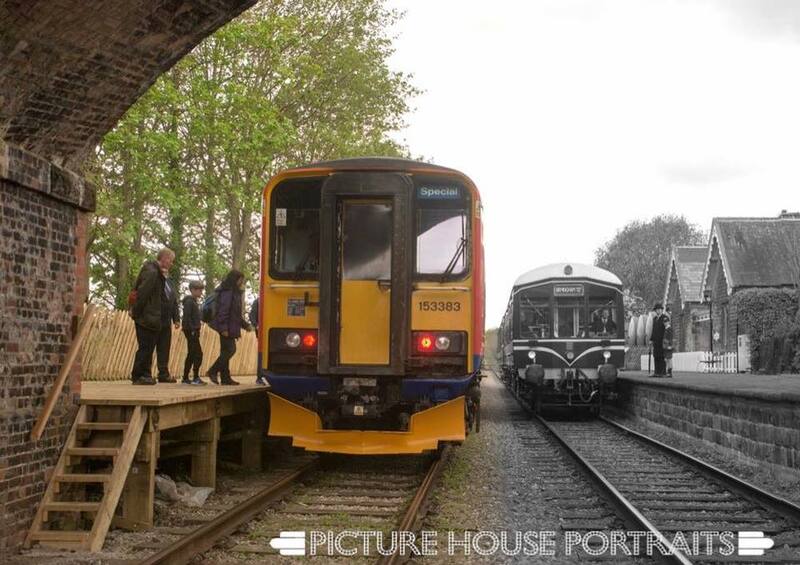 It is the final chance to ride on a heritage diesel railcar on a weekend this weekend until 9th September! This is probably the longest this railway has been since we started operating without some sort of DMU service on a weekend. They'll be running Thursdays from 1st June until 28th September and Fridays in July until 11th August. Main line diesel locomotives do the honours from 30th May until 19th September. A beautiful sunny day in the Gem of the Peak and fairly busy for one where there's no passenger trains. We hosted a Bronze Drive a Diesel Day today with the 'bubble' doing the honour to Duffield this morning and the Class 31 going between Wirksworth and Shottle this afternoon. It is very unusual for us to have two consecutive days of driver experiences! But, a mild flutter of the heart was felt when a coach turned up late this afternoon. Naturally, one would worry that the booking system had gone wrong but fortunately they have just popped in on the off chance on the way to somewhere else and weren't expecting a train ride. Needless to say it kept the Booking Office fridge and ice cream freezer busy. There was a frenzy of activity down the yard in preparation for the DMU Gala this weekend. Iris had the fuel supply problem discovered on Tuesday afternoon remedied which ensures that vehicle is healthy for the weekend and both Iris and the 'bubble' had their fibreglass domes hand washed to get the green off this afternoon. Some more units were fuelled to and positioned ready for the event. One of the coaches had some buckeye repairs carried to ready that for the forthcoming locomotive hauled trains. Down the line, a small PW team continued their seemingly never ending quest to grease fishplates. A gorgeously sunny day here with better passenger numbers than yesterday, further boosted by a party from Lowestoft. They enjoyed afternoon tea in the Pullman followed by a ride through the valley. Down the yard, DMU car 51505 received attention to the draw gear and also to a small oil leak on one of the engines in preparation for the gala next weekend. Meanwhile, a small team continued with the restoration of the Derby Lightweight with a focus on underframe components. The Class 31 had a power fault fixed which turned out to be a dicky control air switch so that should be good for the upcoming driver experiences later this week. A beautiful sunny day, perfect for a Drive a Diesel Railcar Day. The 4 participants really enjoyed Graham and Richard's hospitality. We waved goodbye to the Blackpool tram once again as it returned to Derby for further work. Some digging work took place in the yard to lay new water pipe and cable for the Maintenance Facility Extension. Can't believe nobody used the phrase "May the 4th be with you" today! Anyway, down the yard the team replaced a split coolant pipe on the shunter "Tom" and the blue two car DMU had a bodyside wash. Dan was in the shed working on the BSK readying that for service in a few weeks time and Lee was next door doing the same with the CK. The PW team were down the line continuing with their never ending programme of repairs and renewals. There really seemed to be a buzz about the place today as we enjoyed the bright and surprisingly warm spring sunshine. First thing a large group of walkers set sail from the station aided by our own Vince and Neil to undertake a circular route taking in the Cromford and High Peak railway via Black Rocks, a call at the magnificent Lee Wood Pumping station that was operating today, a short trip via EMT to rendezvous with our 3pm service leaving Duffield finally returning them to Wirksworth. A great way to take in several aspects of our local industrial heritage. Back at base all attractions were in operation and judging by the cars in rows in the carpark these were indeed appreciated by our guest young and old. The gift shop, buffet, bric a brack, model railway and museum coach provided a range of interest for all. 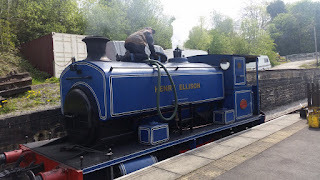 On the incline the steam team operated a charter and then pay and play service with Henry Eillison and a brake van. I spoke to the charter customers as they completed their session asking if they had enjoyed their morning. I was greeted by a huge smile through a modest layer of soot and his only comment was "just awesome!". Throughout the day we took regular questions about when and how to take a ride on the steam service, the attraction of steam clearly shows no sign of abating. 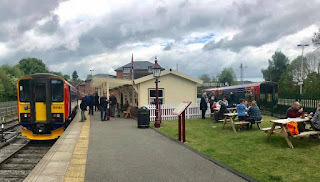 Our mainline service was provided by the three car set and it transpired this was a wise choice, our mid afternoon service left Wirksworth with just in excess of 80 guests on board and it would be fair to say every one of our four services recorded good passenger numbers. We should not overlook that last night was our Jazz and Real ale service with traction also provided by our own steam engine, work was ongoing this morning cleaning the carriages and it should also be noted that some of our volunteers who finished helping with the special event very late last night were back onsite first thing again this morning to do another full day. Down the yard a small but deeply determined group from our engineering team were trying to remove bolts from one of our corridor connections using an eclectic mix of bars, spanners and hammers. Its seems said bolts were fitted by an equally determined engineer several decades ago who probably walked away from the completed job muttering, "they won't come out in a hurry!". Towards the southern end of the Wirksworth site Ron had executed a full line possession on the miniature railway and over the last few days has fitted another three panels of track. This developing new asset to our railway will without doubt be a hit with our younger guest once fully operational. Brandon is pictured below undertaking some driver training and is expected to be able to sign the route in due course. A busy but enjoyable day, I leave you with pictures of Henry Ellison.. Typical Bank Holiday weather here at Wirksworth meant a cold but dry day greeted our visitors. The Duffield service enjoyed good passenger numbers throughout the day. Unfortunately , due to a rostering issue we were unable to run a steam service to Ravenstor today much to the disappointment of many of our visitors. Thankfully Richard was at hand to conduct yards tours which proved very popular. The miniature railway team were also in attendance putting the finishing touches of paint on the new fence. Down the yard work was taking place on the Duke's footplate and the LMSCA continued work on the BSK. Today's service was supported by the EVRA Shop, EVRA bric-a-bac sale, model railway and Pullman Buffet. Thanks to everyone who gave up their time today to ensure we had a successful start to the bank holiday weekend. A good steady flow of passengers came to visit our railway. The Duffield service was worked 55006/79900 "Iris". The Ravenstor service was worked by "Henry Ellison". All our activities were supported by the buffet and the EVRA bookshop and the model railway. On the station one of the volunteers cleaned and painted one of the station bench seats. Down the yard LMSCA worked on parts for the BSK restoration. EVRA were working on the SO (buffet) to complete it before the summer services starts. In the shed work continued on the CK and the RF buffet corridor bolts. The platform at Ravenstor was weeded and tidied by the guard of the train between arrival and departure (just like lightning this chap). It was quite a pleasant and satisfactory day. Thanks to the train crews and all the volunteers at Wirksworth and Duffield who helped our railway progress today. A good steady warm day with a steady flow of passengers coming to travel on our railway. The Duffield service was worked by Dmu's 55006/79900. The Ravenstor service was worked by "Henry Ellison"
The services were supported by the buffet and the EVRA bookshop, on the station one of our volunteers was refurbishing one of the station bench seats by sanding and painting. Also at the station the model railway was in operation. EVRA were carrying out repairs to the SO (Buffet) to get it ready for summer service. In the shed also being worked on was the CK and the RF Buffet corridor bolts. The platform at Ravenstor was tidied up by the train guard between arrival and departure of the train. Quite a pleasant and satisfactory day. Thanks to the train crews and everyone at Wirksworth and Duffield who helped our railway to progress today. A new month and a Bank Holiday Monday only saw moderate passenger numbers in comparison to the previous two days which were above and beyond expected. The three-car more than capably handled the service but the steam on the incline was busy. Work continued in the shed on the EVRA CK and more stripping work was done on the interior of the RF kitchen car. The 27-way multiple working jumpers on the Class 31 were rewired and tested. I suppose they're more of a novelty feature on a preserved railway but its nice to know they're usable if needs be. The DMU sets required for service in the next few days were fuelled and checked over.